For millions of years there lived a rather large species of kangaroo in Australia called sthenurines. Weighing in at 550 pounds and featuring a 6'6" frame, these Pleistocene creatures must have been an awesome site — an animal made all the more remarkable by virtue of the fact that they walked around on their feet just like humans. These rabbit-faced roos are known to paleontologists as "short-faced kangaroos" and they lived Australia for an impressive 12.5 million years before mysteriously dying out some 30,000 years ago. It's possible they went extinct on account of Australia's growing arid climate. Now a new paper by a Brown University research team posits the hypothesis that these kangaroos didn't hop. A rigorous comparative analysis of kangaroo anatomy shows they were bipedal walkers not dissimilar to humans. The research team, led by Christine Janis, collected multiple data points to back the hypothesis. At a fundamental level, sthenurines were unlike the large red and grey kangaroos of today. Their hind limb bones were markedly different, and what's more, they had teeth for food browsing rather than for grazing (like modern roos). And of course, at 550 pounds, these giants were scarcely capable of hopping. Unlike modern kangaroos, who actually move using five limbs, these animals had bone structures resembling those of animals that move by shifting weight from one foot to the other. A flange at the base of their shin bones, similar to those found in horses and humans, would have prevented their feet from collapsing sideways under the weight of their body. Did You Know Kangaroos Have 5 Limbs? And like primates, their pelvises fanned out at the rear. Additionally, they were proportionally more robust, or big boned, than modern kangaroos, and their spines were relatively inflexible, suggesting that hopping or pentapedal locomotion would have been difficult. Also, their hands were ill-suited for supporting their weight, and were more specialized for foraging. "If it is not possible in terms of biomechanics to hop at very slow speeds, particularly if you are a big animal, and you cannot easily do pentapedal locomotion, then what do you have left?" says Janis. "You've got to move somehow." Given that they were bipedal and featured dextrous hands, one has to wonder if, given different environmental circumstances, these creatures could have evolved human-like intelligence. Impossible to know, but fascinating to think about. 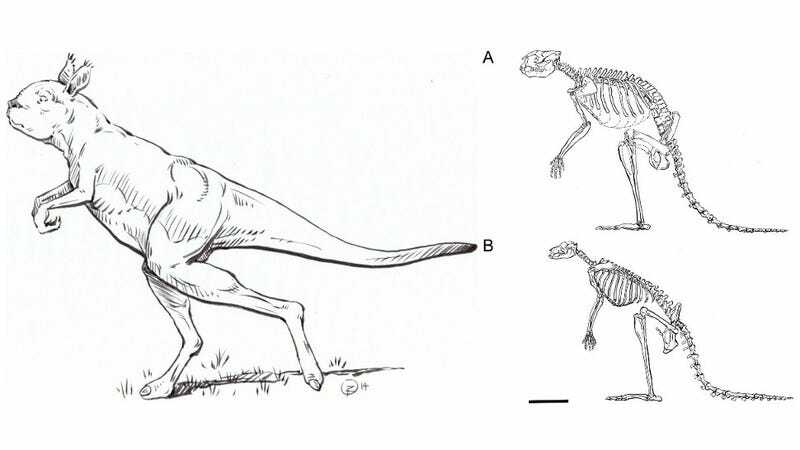 Read the entire study at the open access journal PLOS ONE: "Locomotion in Extinct Giant Kangaroos: Were Sthenurines Hop-Less Monsters?"